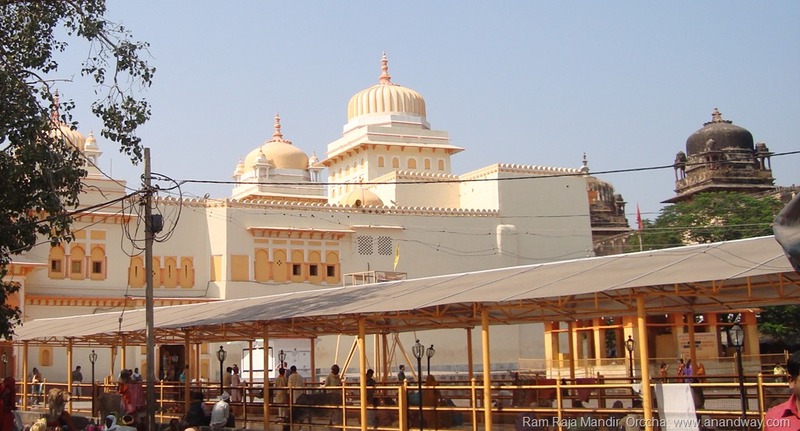 Ram Raja Mandir in Orchha has a beautiful story behind it. 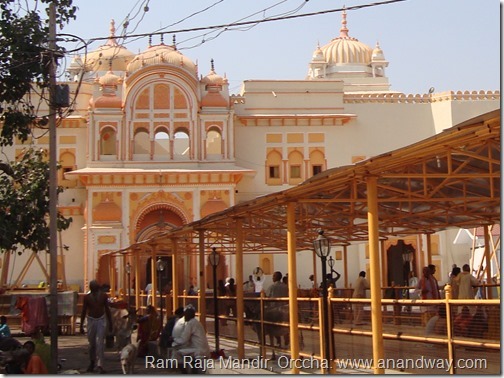 The Queen of Orchha worshipped Lord Ram as Kaushalya his mother loved him. She visited Ayodhya, and brought back Ram Lala, the deity Ram as a child. 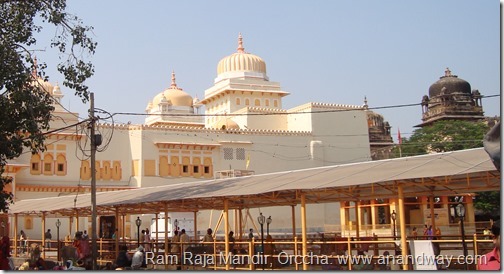 The famous Chaturbhuj mandir in Orchha was originally built for Ram Raja from Ayodhya. This temple is opposite the palace, from where the Queen could always keep an eye on her divine child. Unfortunately, when the deity arrived from Ayodhya, this temple was still getting its finishing touches, and the Queen placed the deity in her kitchen and took great care of him. When the Chaturbhuj mandir was finished to perfection, and the Queen was ready to take Lord Ram there, Ram refused to leave her kitchen where he had received so much love. This kitchen was then converted into a beautiful temple, now called Ram Raja Mandir. In the Chaturbhuj mandir, Sri Laxmi Narayan was then placed. I received prasad of peda and paan after darshan of Ram Lala at Ram Mandir, Orchha. There are beautiful wall paintings in this temple, depicting the Queen of Orccha as a mother to the deity. I visited the temple a day before Kartik Purnima. Marigold and roses were stringed into garlands and decorated the temple premises and courtyard. The feeling inside the premises was exhilarating! Villagers came from far and wide for darshan of Ram Lala, and their simple, unconditional devotion made the air sweeter. 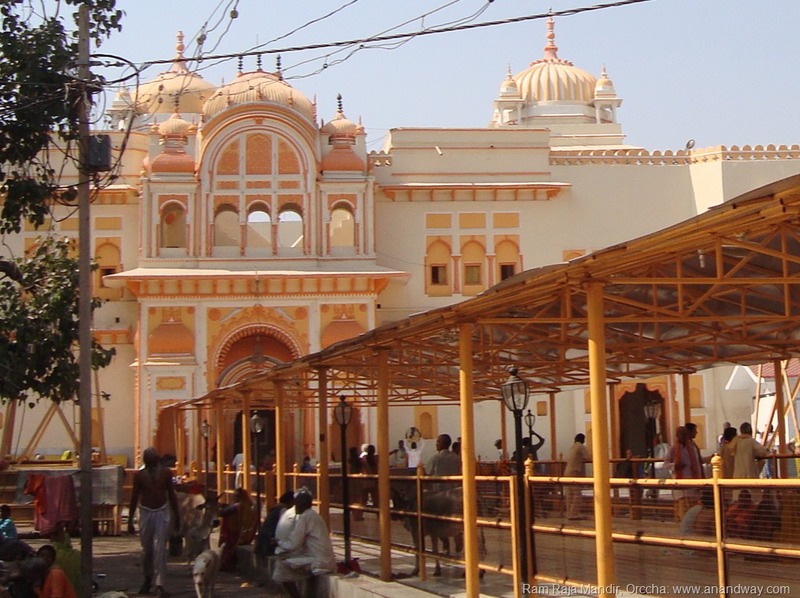 How to reach Orchha from Jhansi, Uttar Pradesh?